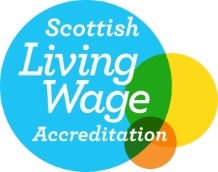 This year CAS became one of 500 Living Wage Employers in Scotland. This means we guarantee to pay staff an hourly rate set by the Living Wage Foundation – currently £8.25 per hour. Now the cynical, or perhaps just the observant, among you may point out that as an IT business operating within a very competitive market in Edinburgh, very few employees are going to be paid the Living Wage at our firm. And this is correct. Paying the Living Wage isn’t going to attract a queue at our door of IT specialists wanting to work here. So of course we pay a competitive rate within the industry, and can also offer the benefits that come from being an employee-owned company. However, that doesn’t mean that signing up to the Living Wage is irrelevant for a company like CAS. In addition to our team of in-house specialists, there are many other businesses that supply CAS, from those that provide the water coolers, to those that deliver our cleaning service. Ensuring that these individuals are also paid at least the Living Wage, goes some way to promoting fairness and dignity as they provide a service to our relatively prosperous industry. The Living Wage Foundation goes one step further than the government’s new national living wage, brought in this year. Whereas it ensures pay rates of £7.20 per hour for those aged 25 and above, the Living Wage Foundation sets its hourly rate based on criteria used to analyse the cost of living and has concluded £8.25 per hour should be paid. Ken Naismith, CAS Chief Executive, says: “When we first considered joining the Living Wage Foundation movement I dismissed it as not relevant to a firm of well-paid IT specialists. However, when I thought about it, there are other companies whose services we employ, and they are benefiting from our pledge to pay the Living Wage.